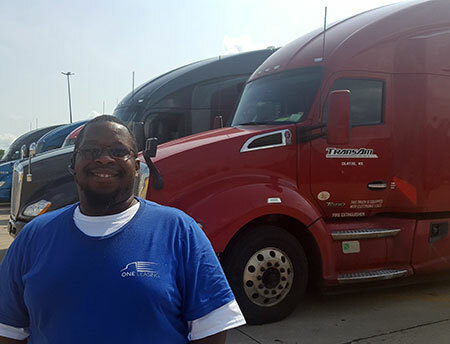 Moses Jones came to TransAm Trucking straight out of trucking school in May of 2013 and later chose to become an independent contractor with TransAm after considering his options. “I’ve never looked back,” Moses said. 6-month leases from ONE Leasing are his specialty. “Freedom,” he replied when asked why he prefers 6-month leases. “I can upgrade whenever I want.” However, this does not mean Moses changes trucks all the time. He’s only had 2 trucks over the years. Why stay with the same truck? Because he knows it. “Pay attention to your truck,” advised Moses. Performing daily pre- and post- inspections helps you obtain intimate knowledge of your vehicle. The more you know about your truck, the easier it is to quickly spot issues. Fuel is another big part of knowing your truck. “Watch your fuel,” he said. Know how much your truck weighs with a full, half, and quarter tank. Pay attention to the weight of your loads. These things affect your weight limit and knowing how to stay under your limit can help you avoid unnecessary DOT violations at weigh stations. Being a truck driver means paying attention both in and out of the truck. Moses lives by these words. He knows his truck so well, he can tell a mechanic if there’s an issue before anyone even looks under the hood. This attention to details also keeps him safe over-the-road. Zero accidents/claims since he became a truck driver. Thank you, Moses, for choosing to contract with TransAm Trucking. We appreciate what you do.